The Eurasian Economic Union has signed a MoU on trade and economic cooperation with China. 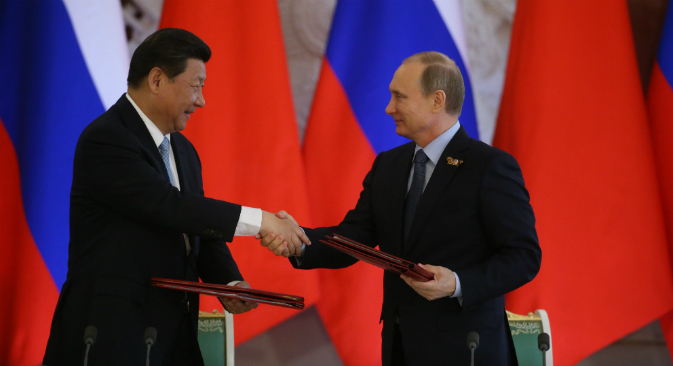 As a result, Russian companies could receive investment from Chinese banks within the framework of the Silk Road project, even though earlier this project was considered an example of Chinese expansion into Central Asia to the detriment of Russian interests. The largest integrated association in the former USSR - the Eurasian Economic Union, comprising of Russia, Kazakhstan, Belarus, Armenia and Kyrgyzstan - has signed a memorandum of understanding (MoU) on trade and economic cooperation with China. The MoU calls for joint investment in the development of infrastructure within the framework of the Chinese Silk Road Economic Belt project, said Minister of Trade of the Eurasian Economic Committee Andrei Slepnev. The sides will give their consent to the first details of the agreement by the end of 2015. Slepnev says the agreement will differ from a WTO-style trade agreement in that it will not impose large-scale import taxes and that it will stress on cooperative investment projects. The future agreement will help the Eurasian Economic Union (EAEU) with its investments in the industrial and transportation sectors, as well as in services and infrastructure. “China's current leader Xi Jinping is one of the creators of the new Silk Road project, having underlined its strategic importance even before assuming the country's highest post,” says Dmitri Bedenkov, Director of the Analysis Department at Russ-Invest. He believes the project has a strategic meaning first and foremost in the political sense. Bedenkov explains that the idea of the Silk Road consists of the fact that the regions in which the project will be realized have substantial investment potential in their transportation infrastructure - about $7 trillion. However, most countries lack financing. For this the Chinese government is implementing a credit program for the project's member countries, both directly and through various institutions, including with the help of the Asia Infrastructure Investment Bank, whose co-founders include EAEU members Russia and Kazakhstan. “The effective development of EAEU structures calls for cooperation with the Silk Road project, not competition with it,” says Bedenkov. Until now Russia has signed a similar trade agreement only with the European Union in 1997. “The Agreement on Partnership and Cooperation,” had a big impact on the development of bilateral relations. However, Ilya Balakirev, Chief Analyst at UFS IC believes, the EAEU and Silk Road projects are slightly different in their idea. The EAEU is a “centripetal” formation, while the Silk Road, as any road, is a “course” that is directed outwards. Dmitri Bedenkov remarks that substantive talks between China and the EAEU are due to start in July-August 2015. The main idea for EAEU in signing this agreement consists in decreasing competition with the larger Silk Road project, which from the start has been perceived in Russia as an example of Chinese expansion in Central Asian countries.